Planting native plants in your yard is an excellent way to increase wildlife habitat and help the Chesapeake Bay. But what makes native plants so special? And which plants are “native,” anyway? First, the basics. Native plants are flowers, ferns, trees, shrubs and grasses that have always grown in our region. They’re the plants you often see growing naturally in forests and roadside meadows. Because they’ve always grown here, native plants are adapted to our soil, climate and pests. This means they don’t need to be watered, fertilized or sprayed with insecticides like non-native plants that are imported from other parts of the world. 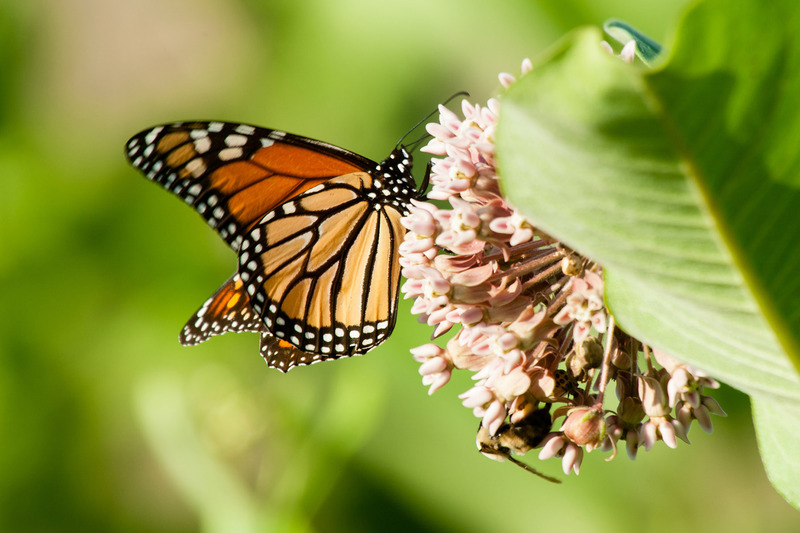 Native plants provide the best source of food (seeds, berries and nectar) for bees, birds, butterflies and other wildlife because these plants and animals evolved together. You’ll likely attract more honeybees, hummingbirds and butterflies to your yard if you plant native species. Some common native flowers are black-eyed Susan, coneflower and wild columbine. Native trees include sweetgum, red maple, Eastern redbud and American holly. But these are just a few of the hundreds of plants that are native to our region. There is an important distinction between naturalized plants and native plants. Naturalized plants, such as Queen Anne’s lace, are not native to our region and spread on their own. Some naturalized plants may actually be invasive, which is bad for your yard and for wildlife. How do I choose the right native plants? Now that you know all about native plants, how do you decide which ones to plant? Another benefit of landscaping with native plants is that you don’t have to amend your soil to create a beautiful garden. Since native plants are adapted to local growing conditions, they’ll do just fine in whatever soil exists in your yard – even the heaviest clay or driest sand. The guides listed above will help you identify which native plants will work best in your garden. Where can you buy native plants? It can be difficult to find native plants at many local nurseries. Your best bet is to seek out a nursery or non-profit organization that specializes in native plants. The following links list local and online retailers where you can purchase native plants. Because native plants grow wild in many areas, you may be tempted to collect plants and seeds from a nearby park, meadow or forest. However, we don’t recommend this. You can do more harm than good by walking through fragile natural areas and taking seeds that would otherwise help the plant spread in its native habitat.